Nestor continues his monthly signings at Dallas Court. We at RAPAR would greatly appreciate the presence of any supporters to join our regular solidarity vigil as he signs at the Home Office Reporting Centre in April. ​The nearest tram stop is Langworthy, just around the corner from Media City. RAPAR will be joining Nestor Sylla as he signs at Dallas Court again this month. We urge everyone to join us solidarity with Nestor outside the Home Office Reporting Centre near Salford Quays (nearest tram stop; Langworthy, just around the corner from Media City). ​Join us as we support Nestor Sylla outside Dallas Court Reporting Centre this Thursday. RAPAR Vice-Chair Nestor Sylla is signing at Dallas Court Home Office Reporting Centre. Please come along to support Nestor if you can. An astonishing 5,700 changes to the immigration rules have been made since 2010, a report in The Guardian has revealed. Nestor was left in a “whirlpool of bureaucracy” following the changes which senior lawyers and judges have said make the visa system almost impossible to navigate. The rules have more than doubled in length to almost 375,000 words, and it has resulted in a complex system, described by Lord Justice Irwin as “something of a disgrace”. The new home secretary, Sajid Javid, has indicated there will be a change in tone but has yet to substantially change course on policy. The Guardian analysis shows that, at times, new sets of changes were introduced just one week apart – and, on seven occasions, even less. One document was published in March 2014 with 22 changes, only to be superseded three days later by a second version containing another 250 changes. The overall number of changes made to the rules since 2010 spans almost 600,000 words, running to a length greater than Tolstoy’s novel War and Peace. Many thanks to Manchester Quakers, Manchester City of Sanctuary and other friends and supporters who came to Dallas Court to stand shoulder to shoulder with Nestor. Nestor is under threat of detention and removal from the UK despite the fact that he has lived in Manchester for 12 years. His case has been described as being caught up in a "whirlpool" of Home Office bureaucracy. Thank you to everyone who has signed the petition and left supportive comments. They are greatly appreciated. Please keep updated with Nestor's campaign and share and sign his petition. Nestor and his supporters outside Dallas Court on Thursday 16th August. 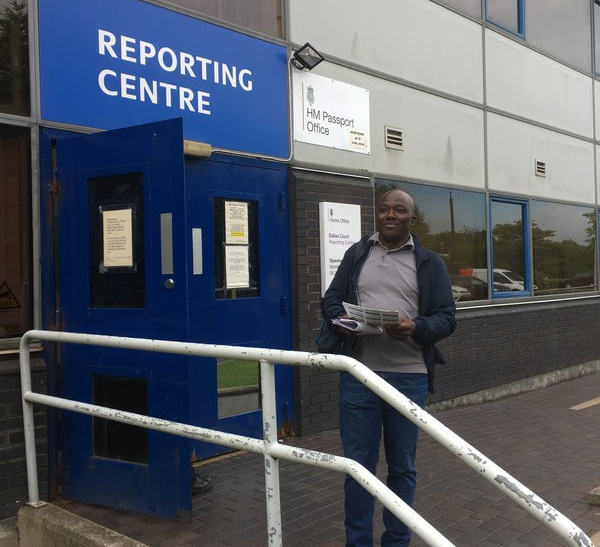 A vigil for Nestor was held at the Home Office Reporting Centre, Dallas Court, Salford, on July 19th when he signed there shortly after receiving his refusal letter from the Home Office.. Speakers included Quaker Elizabeth Coleman, Steve North from Salford City Unison branch and Jane Graystone from City of Sanctuary. Many thanks to all the friends who came along to support Nestor. "When Nestor first came to this country 11 years ago, there was an expectation that asylum seekers would show a commitment to their community, which he has obviously accepted and demonstrated. Such involvement inevitably leads to social and emotional attachments being formed. It seems that during this time he also had grounds for believing that his asylum claim might be successful and he would be allowed to stay here permanently, as he tells us that at one stage he was entitled to obtain a Visa, when historical applications or excepted for a limited period, but unfortunately the solicitor acting for him missed the deadline. A subsequent appeal against the decision was then considered separately from his 'legacy papers' and refused. We feel strongly that after this length of time not only should Nestor be allowed to continue with the life he has established here but that he has proved that he would be an asset as a resident of the UK." A Guinean man, who has made his home in Manchester for the last 12 years, has been caught up in a Home Office “whirlpool” of bureaucracy and is now at grave risk of detention and removal from the UK. Nestor Sylla, who is vice-chair of RAPAR and is involved with other charitable organisations in the city, came to Europe at the age of 26 looking for his mother after the death of his father and the murder of his sister in Guinea. He had been forced to leave Guinea after being attacked, persecuted and threatened by his stepmother and her family because of a dispute over his father's inheritance. You can download a copy of the petition from here. You can use these support letters for Nestor to send to MPs. There is one model letter for constituents of Lucy Powell and another model letter for constituents of other MPs. It is fine to use the model letters as they stand but it would be better to use them as a basis for your own letters, particularly if you know Nestor from the Night Shelter or other work.